Are You Looking For a Scale to Weigh Vegetables? On this blog we often talk about digital scales that weigh items and calculate price per pound. Often though we don’t discuss what types of items you can weigh with one of these retail scales. Anytime that a potential customer searches for a scale to weigh vegetables hopefully they will click on this site. Virtually, any of the scales that we have featured on this site in the past would be good choices to weigh most any type of vegetable. The tricky part can be the vegetable size and weight. 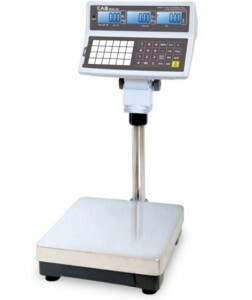 For example if you were weighing heavy vegetables or a larger quantity then you might need a price computing scale with both a larger weighing surface and/or a larger weighing capacity. If that were the case, the CAS EB scale series could be the right choice for you. The CAS EB Series bench scale style Price Computing Scale with large capacity features your choice of three capacities available, with a maximum capacity of up to 300 pounds. Large Platform of either 13.8″ x 15.75″ or 15.75″ x 20.75″ is great for bulk weighing. And, if you wish a printer can be added to produce crisp, clean receipts and labels with the optional DLP-50 Label Printer or DEP-50 Receipt Printer. This scale could be a great choice for you if you find yourself constantly placing large items or large quantities of items on your traditional counter top digital scale. Of course the CAS EB series is NTEP approved with Certificate of Conformance COC #09-095. Effective immediately, both the CAS Wireless (PCL1) & Wired (PCL2) Ethernet Cards are being replaced by new and improved cards. Sometimes there are ideas or reasons for changing what works. Maybe you are looking to improve a product or change something to lower the cost of an item. When it comes to the CAS LP1000 price computing scale with printer sometimes it is best to use the reliable proven scale. The LP1000 continues to be one of the more popular label printing scales on the market. Customers have been asking for this specific model for years. The scale is a very good scale and the labels are easy to purchase. One note to consider, if you are just looking for a simple label with weight and price, you may want to consider something like the CAS S2000 JR price computing scale. However, if you are looking for a legal for trade printing scale that can print ingredients or have built in Price look ups, the LP1000 is the scale for you.